It is practically a necessity for any shopping center to have a coffee place. Nothing gets your shopping juices going like a good cup of Joe. The Boulevard is no different, but they boast a unique, local coffee beanery in the form of Viva Café. A family owned and operated coffee shop, Viva Café provides quality caffeinated goodness with the top of the line equipment and a great, customer friendly staff. Espresso drinks, baked goods, delicious sandwiches, and teas are just the tip of the iceberg. Viva Café sets itself apart from those repetitive brand name coffee places. Much like the rest of The Boulevard shops, Viva Café is an independent name, a hidden gem; that succeeds with specialty drinks and personable service. 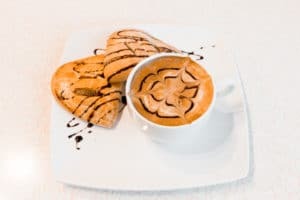 A rise in more gourmet coffee shops is due to an increasing interest in specialty drinks; handmade drinks made just for the customers; generic coffees are no longer the most popular thing around. Smaller shops like Viva Café bring a community feel to their business, which attracts more customers and makes them feel comfortable. According to an article in Aabaco Small Business, coffee shops are “assets to the community; they serve as meeting places…not where you work or live…people need that.” With a traditional café hacienda-inspired feel, Viva Café treats everyone like they are more than just customers; they treat them like old friends. When you want to take a break from the bigger coffee shops, stop by Viva Café for a personalized and delicious coffee experience. A family owned and operated business in Las Vegas’ newly renovated The Boulevard, Viva Café offers high-quality specialty drinks and foods with reliable service. Already a central location for independent stores, The Boulevard once again provides a unique experience for all guests. Check out this cool video featuring Viva Café with Thrifter’s Anonymous.